Most troubling is the €200 000 it wants to pay the chair of the audit committee. Steinhoff’s proposal to pay five current and former (non-executive) directors sizeable once-off payments in lieu of the “additional work undertaken during the period since the accounting irregularities were identified in December 2017” is downright outrageous. It wants to pay Steve Booysen and Heather Sonn €200 000 (±R2.9 million) each, and Johan van Zyl €100 000 (nearly R1.5 million). Booysen is head of the audit and risk committee, while Sonn has been acting chairperson since Christo Wiese stepped down on December 14 2017. Separately, the three independent directors were appointed members of an independent board subcommittee in early December. Shareholders have been asked to vote on the proposal at the company’s AGM on April 20. The shareholders (who remain) should treat this resolution with the contempt it deserves and vote it down. The problem is, they likely won’t. It has, rather shrewdly, lumped together the proposed extra payments and the standard remuneration for members of the supervisory board in a single resolution. If these had been separate resolutions, we may very well see a different result. The fundamental problem here is that these are directors of the company with fiduciary duties, not external professional consultants. They signed up for this, and have been well-compensated for their roles. The fraud happened on their watch! One might argue, correctly, that the demands on Sonn have increased substantially since she took over as acting chair in December. Her honest and transparent (and humble) letter to shareholders in the quarterly update to end-December was a breath of desperately needed fresh air. But why not then pay her the previously approved rate (€300 000/±R4.4 million a year), pro-rata, for the chair position? While all (current and former) directors are to blame here, the proposed extra payment to Booysen is particularly galling. He was and continues to be the chair of Steinhoff’s audit and risk committee. This body exists “to supervise and monitor the activities of the management board with respect to” practically all matters relating to audits (both external and internal), and the company’s finances. Spare us the pleas about this being a “complicated” financial fraud. Booysen ought to have resigned in disgrace. In the motivation for Booysen’s reelection to the supervisory board at the April AGM, the group says “the nomination committee is of the unanimous opinion that his knowledge and experience match the desired expertise, and that his reappointment safeguards the continuity and knowledge of the organisation within the supervisory board.” Quite who serves on the nomination committee considering the board currently comprises four directors is unclear. (One may argue that Van Zyl was the most recently appointed of the three – he has only served on the supervisory board since May 30 2016 – but the once-off payment here also does not seem justified). That they did not jump ship, like most of the other directors, speaks to either their integrity, their need to attempt to restore their professional reputations, or both. The board has also proposed one-off payments of €40, 00 (±R600 000) to Konar and Lategan, who jumped ship “retired” from the supervisory board on February 28 2018. Again, the group attempts to justify this because of “the exceptional demands placed on their time during the period since the accounting irregularities were identified in December 2017”. It must be noted that these once-off payments are in addition to the fees these directors earned were paid in the 2017 financial year (to September 30), as well as any fees paid for the 2018 financial year so far. 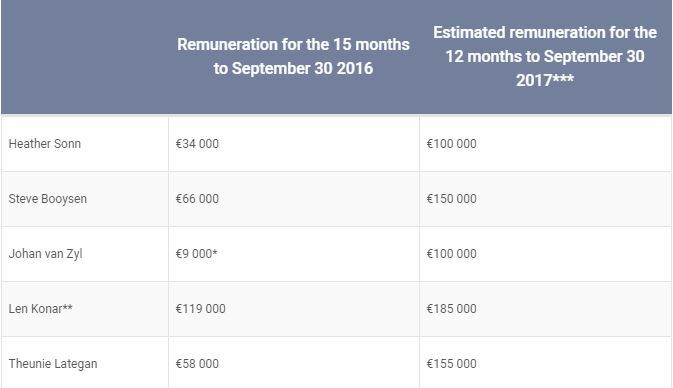 If Sonn, Booysen and Van Zyl serve for the full FY2018, they will be paid €100 000 (nearly R1.5 million) each, just for their roles as members of the supervisory board. All three will earn more for their additional roles on committees (Sonn will be remunerated for her role as acting chair).